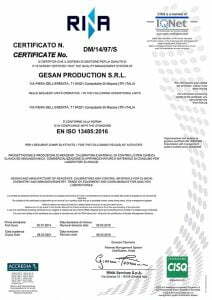 Gesan Production was established in the 90s and nowadays is one of the most international accredited Clinical Chemistry Reagents manufacturing company. Its Mission aims at developing and producing high quality liquid reagents, and simple-to-use for the final customer. Gesan brand wants to be synonymous of Quality and Eccellence, as represented by Made in Italy. All the activities respect the environment and preserve natural resources for the future generations. In 2014, the production site obtained ISO 14001 certification, as the production activities consequences were reduced and the development was promoted. Waste recycling and disposal activities together with modern production processes allow to reduce consumption and environmental pollution at minimal levels. Gesan in the World is the international project of Gesan brand, that led us in laboratories and hospitals of more than 50 Nations in the world.